Stratified 9.0 with 1 revision - 91 Octane, Stage 3, 5200 feet elevation. 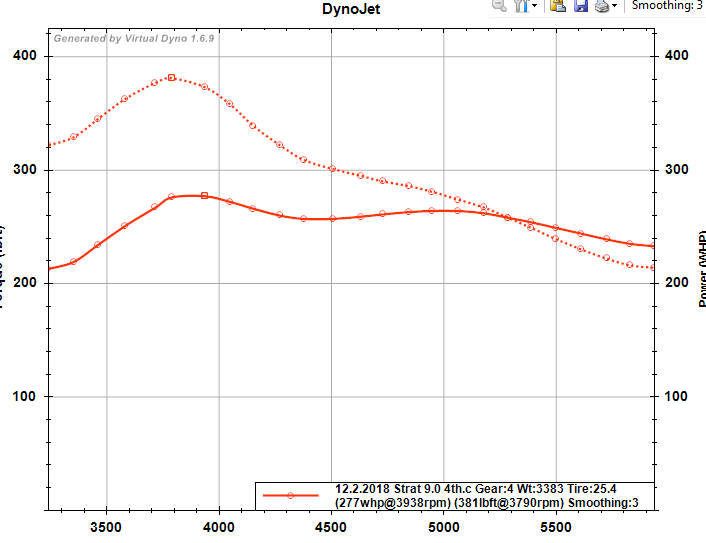 Virtual Dyno using default Dynojet corrections. Road had a slight dip in it which I went over around 4,000-4,500 rpm. That may have thrown off the early peak power. It was showing 267 at 5,000. Last edited by FoST2016; 01-13-2019 at 04:24 PM. 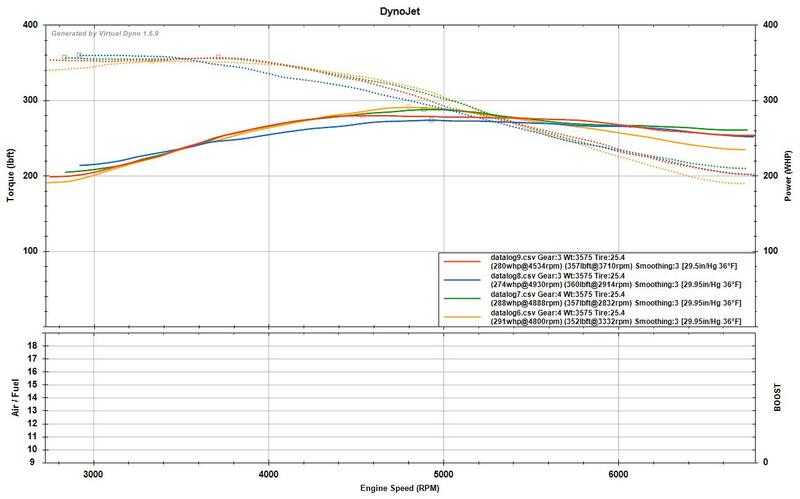 I start my logging in 4th gear at around 2500 rpm and run it untill the revlimiter kicks in at redline. That time was only rpm, hp, and tq logged. If that doesn't work it sounds like your road might not be that smooth or you are loosing traction even though you are not feeling it. When I do my logs I also turn off traction control, and the air conditioning. I have some good stretches of road around here but I can't hardly do logs in 3rd gear anymore, at least until I get better tires and it warms up because I am losing traction now in 3rd so I'm stuck with 4 gear pulls which isn't as easy to accomplish safely all the time but there are times that are safe. 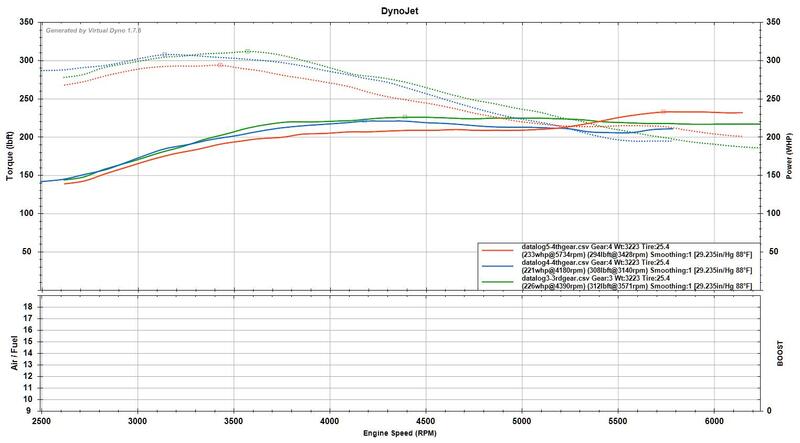 I've learned that 4th gear pulls are more accurate anyway, that's what Stratified tells me. 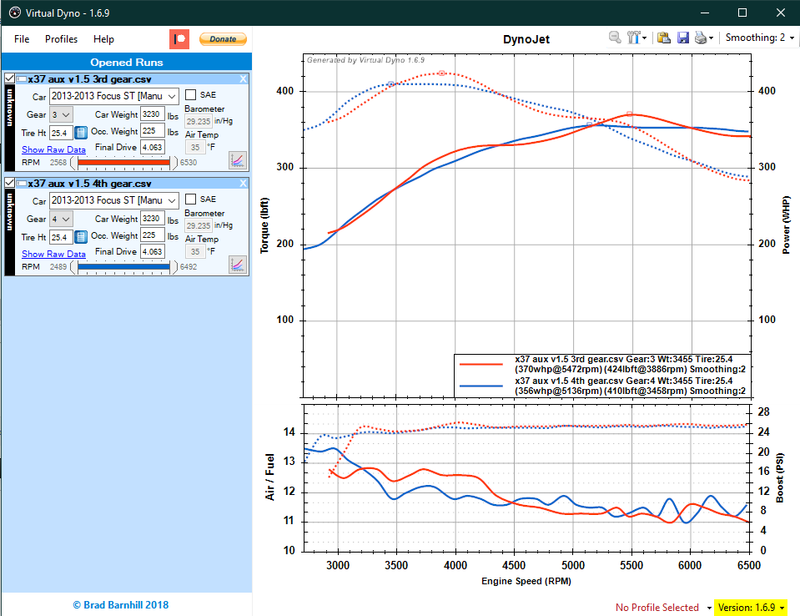 X37 hybrid turbo with 2 port aux fuel tuned by alex at stratified. Quite a potent combo. What fuel are you running? All that torque makes me think Ethanol. First pull was the green 3rd gear. 226hp 312Tq, the next 2 runs are 4th gear pulls, heatsoaking like a mofo. Only mods are green filter, AWE track back and Strat 93 tune. This look about right to you guys?